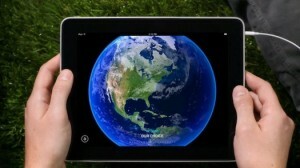 Only 7% of online adults read e-books today, but Forresterpredicts that the e-book market will rise to $3 billion by 2015. Similarly, U.S. tablet sales are projected to grow at an annual rate of 42%, with 20.4 million units expected to be sold in 2015 according to Forrester. The first innovation is geared towards frictionless self-publishing and is the brainchild of former Apple employees Mike Matas and Kimon Tsinteris. Their digital creation tool, called Push Pop Press allows writers and publishers to transform their books or magazines into interactive iPad and iPhone apps. What makes this app quite exceptional is that anyone – you, me, Stephen King or that bastion of online publishing, Conde Nast – can use the tool to create rich, graphics-heavy, interactive e-books with zero programming skills required. A lot depends on the stability of the app and the user experience, but if done right this could spell some pretty big changes for publishers and consumers alike. To begin with, it will allow publishers to finally deliver an online mobile reading experience that’s in line with how readers like to consumer content on the go – in quick snippets, with the ability to easily navigate between sections using rich interactive features. Publishers will also be able to circumvent high costs associated with hiring app developers, a development that may well spell doom for Adobe’s Creative Suite that is currently the go-to default platform for tablet periodicals. Finally, Push Pop Press could turn into a lucrative revenue generator for publishers given the high rates that advertisers are willing to pay for iPad content. Oh and lest we forget, Al Gore’s latest book, Our Choice: A Plan to Solve the Planet Crisis just became available on Apple’s App Store, thanks to Push Pop Press. The second innovation in online publishing takes a diametrically different approach and is based on the premise that apps fail when it comes to user experience and that tablet users will consume content much the same as they’re used to doing in the offline world. Recently debuting the platform at TechStars NYC, CEO Jason Baptiste sells OnSwipe as “insanely easy tablet publishing.” It allows publishers to completely circumvent app stores and offer rich, browser-based navigation that mimics the offline reading experience…and then some. Readers can swipe from page to page, access hidden commenting and sharing features, and save content to queues for later reading. While the user experience is seamless, OnSwipe seems to be focused more on the content provider. Unlike existing smartphone and tablet apps, editors won’t have to repurpose website content – all existing content will seamlessly slot into templates at no cost to the publisher. What makes OnSwipe especially compelling is the rich ad experience with built-in GPS optimization and social features that would be a boon for location-based advertisers willing to pay big bucks. 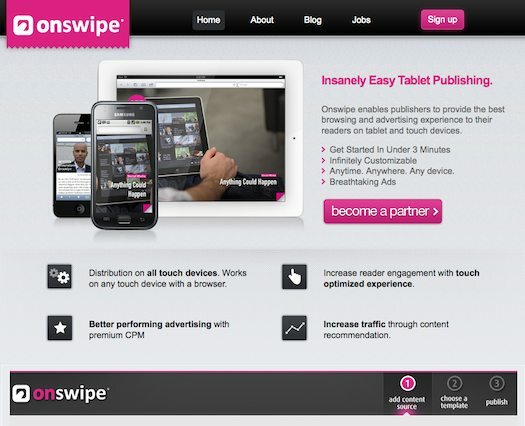 OnSwipe has seen some early success with a planned integration with blogging platforms WordPress and Tumblr this spring. Co-founders Jason Baptiste and Andres Barreto have raised $1 million in their first round of financing and are backed by VC firm Spark Capital and super-angel Ron Conway.